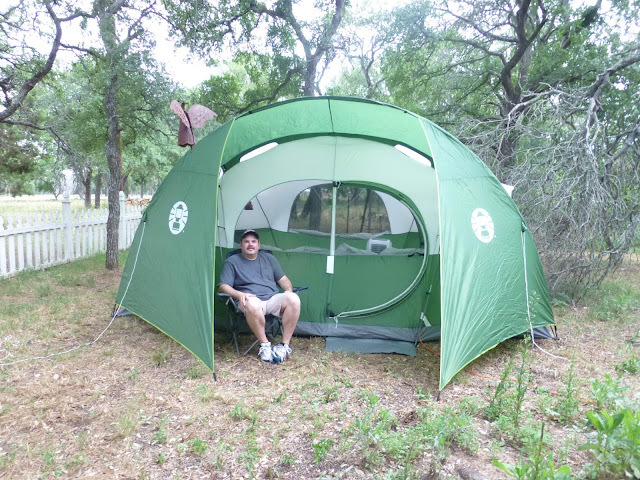 The Gentleman Crafter: My Day Camping! Starting my holiday right now! I just rolled out of bed at 9:28 a.m. Yes, much later than norm. I actually woke up from with my natural body alarm at 6:45 a.m. and rolled over and wished for more sleep. Nothing! LOL! I tossed and turned and my mind whirled....I finally got up and headed for the kitchen to grab a cup of Joe and went back to bed just to watch Youtube videos. I think I went through all the glass blowing videos there are on Youtube so what should it be....Well, if you surf YouTube, you know you can start with one subject and end up with something completely different....From T@B travel trailers to Tiny Houses! When I watch YouTube videos, I'm always amazed at the ingenuity of people. How people take what they have and make it work for them. Creating and forming ordinary objects into something beautiful, useful and meaningful to them. So cool! Watching these videos also stirs my imagination. To be able to pull out paper and a pen and think...dream of the possibilities is so exciting and fascinating to me. I may not have the knowledge to build the things I dream up, but again, how cool is it to try something new. Just thinking and jabbering....Just inspired this morning. The last couple of days I've tried to find a place to go to escape and create...The beach...all booked up, cabins at state parks...gone...even cottages and Bed and Breakfast...full! Lesson learned...You gotta start early reserving these precious places of relaxation and respite during the holidays! So to not be outdone by the hoards...camping it is! In the shade garden at my house! Why not right! 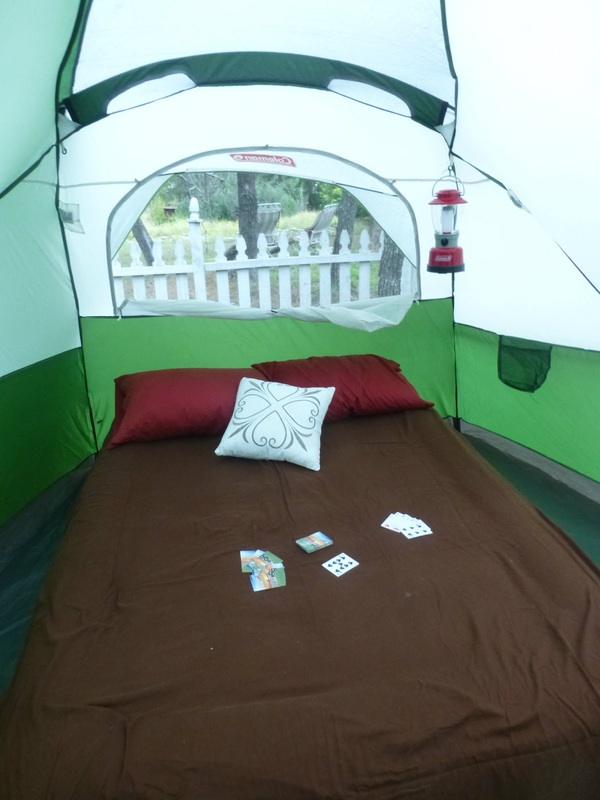 I may be crazy and God knows I know you probably think I am, but I am having the best time blogging, playing cards and taking a nap as the rain hits the top of the tent! OK, It says it takes two people to set this up...Can it be done my me alone???? Who made these instructions! Really!!! OK, so maybe they were right. The poles do need to go on the grommets! OK, the throw pillow may be overkill! Bahahahahahaha! Only bringing the essentials! So glad the wireless internet reaches out here! Yahooooo! Ready! All I need is a campfire! Or Not! Buzzy wondering what in the name of Sister Mary Theresa I'm doing! AHHHHHH, time to relax....Just in time for the rain storm! Wish You Were Here! Hope it doesn't flood! LOL! enjoy every minute of your campout!! It's nice to just kick back and relax even if it's still at home. Love the throw pillow, LOL! What a great idea. Camping is one of my favorite things to do. My kids always loved sleeping outside in their tents. You just relax and enjoy the lovely outdoors noise. Is Cesar sleeping with you? Or have you band everyone? We are missing you on Skype. good thing you are not up here attempting to do much sight seeing. One of the bridges Carol took you over on I-5 fell into the skagit river yesterday evening. 3 people were injured, not seriously, thank God. But the holiday traffic just got a whole lot worse. Now have to be detoured into Mt. Vernon and back over, can you say headache..and add 2 hours to the commute. Happy Memorial Day to you and Cesar, relax, enjoy and roast some marshmallows. Now that looks like fun Jim! Enjoy! Looks like a fine time,to me! Nothing like some rain on a lazy day! Have fun! BELLISSIMO! THAT SHOULD MAKE IT RAIN!!!!!!!!!! Don't know about the campfire...there is a burn ban! Enjoy your vacation! At least you didn't have to pack! Ok... now that's the way to do it!! I LOVE your idea, wish my yard was larger, I'd do that ...hum wonder what my brother would say if I pitched the tent in his yard(he lives behind me; his front yard is larger than mine) ?? 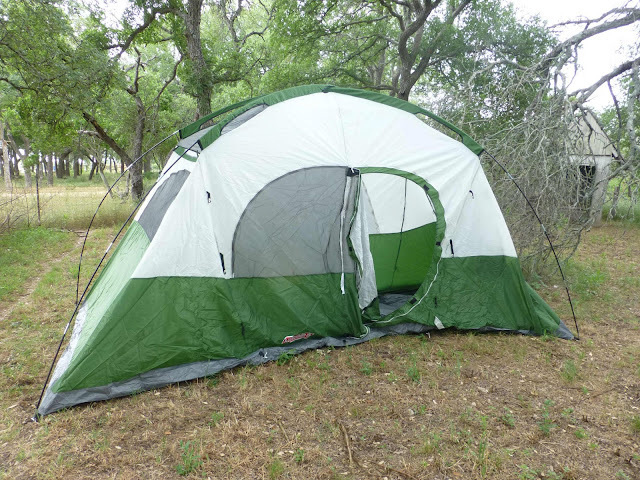 My tent is three bedrooms !! Enjoy your home away from home at home...bwahaha.... we've done the same before here on our property. We've got 22+acres so it's like being somewhere else camping.... and without the crowds. Wonder how much crafty supplies you'll move out to the tent? Honestly, that's my kind of camping... you can always take a time-out and run home for whatever you need. Love the pillow, btw!! that a boy JIM, we do that with the grandkids sometimes but our tent is so big there is no room left in the back yard. we have a pop up trailer we are working to fix up and it has a air conditioner, so tent for the fun of it and camper for the cool down. This is my kind of camping. Very close to the bathroom and you can get inside fast in case of flood. Jim this is great. Sometimes, well with me most of the time, we have to make do with what we have and you sure have done that. Enjoy your camping. ROFL!!! Have you considered sewing a tent out of Tim's new fabric. Just teasing. You can definitely say that you went away for Memorial weekend. Love it. best place to camp, personal loo and toilet lol. Have fun..
Jim! You need a porta-potty! Hope it's not too hot and buggy! Enjoy! One thing is for sure you won't be kicking yourself for forgetting essentials. Have a relaxing time. I LOVE it!! What a great idea for total relaxation. As for the pillow, who says that just because you are in the "great outdoors" you can't do it with flair!!!! How long until you sneak into your studio? I was just thinking yesterday that I wanted to go somewhere so I could just catch up on the pile of reading. Unfortunately it's been raining off & on all week and going into the weekend so backyard camping isn't an option for us. Nor do I think my teenage son would go for it now. Go back to your Wed post and read my comment, if you haven't. I think this should go on your "happy list"! My kind of camping, Jim.......a few yards away from indoor plumbing and the kitchen! Enjoy your down time! Have fun and listening to the rain will give you a lovely, refreshing sleep! Jim, you are such a character!!!!!!! But, if you have to camp this weekend, this is definitely the way to go. I love camping, but prefer to do it when campgrounds are less crouded. This is not an great weekend for that. You mentioned watching videos of glass blowing. Not sure I have ever mentioned that my son is an artist, and one of his many talents is glass blowing. He has made me several pieces thru the years, but my favorites are the hand blown Christmas Tree ornaments that he gifted me with. They are gorgeous!!!! Have a great weekend. Ok...on the "big" computer today....had to unplug because of the storms yesterday so I was on the laptop(with battery)yesterday and for some reason I couldn't comment. So...here were my thoughts about this post yesterday...ROFLMBO!!! This whole post just made me giggle and giggle! 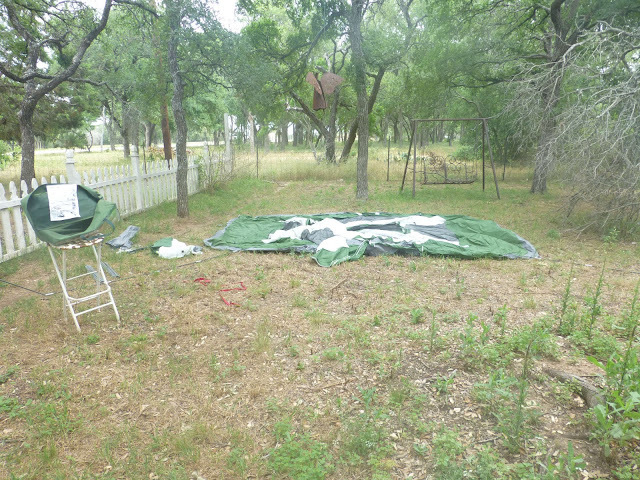 I'm so glad you took my suggestion and pitched your tent in your yard. Did Buzzy ever figure it all out? Are you still out in the tent? That storm that went through would have sent me scurrying back into the house. How long was it before you went back to your studio? I know you couldn't stay away...LOL! How fun are you? Way to go on making the most of it. Just goes to show you that getting away doesn't have to mean far away. Enjoy your weekend! I love your camping idea. When I was a kid I used to sleep outside all the time in the summer it was so much fun. If we got scared we would go in or stay up all night w/o our parents telling us to be quiet and go to bed. I was thinking of your story about the campfire when you and Cesar went camping-maybe not a good idea for a fire. Love your beautiful cat does he/she sleep in the tent too? This would have been the perfect venue to stage your "this-is-my-last-Sunday-show" Ustream! The pillows will all come in handy to prop up your head to continue watching videos with your laptop lying on your stomach. Too bad you converted that outhouse; it may have been closer than going to the house (and it would be sssoooooo much more like real camping). When I used to do more hiking and camping, I'd take what is called a solar shower. It's essentially a large bag you fill with water and leave in the sun to warm up the water. It was heaven, being able to wash away the dirt and sweat of the day. What would your neighbors think about that? ;-) Enjoy the outing. Looks like a lot of fun. Now why didn't I think of that idea? And I have a two room tent, still in the box and never opened. 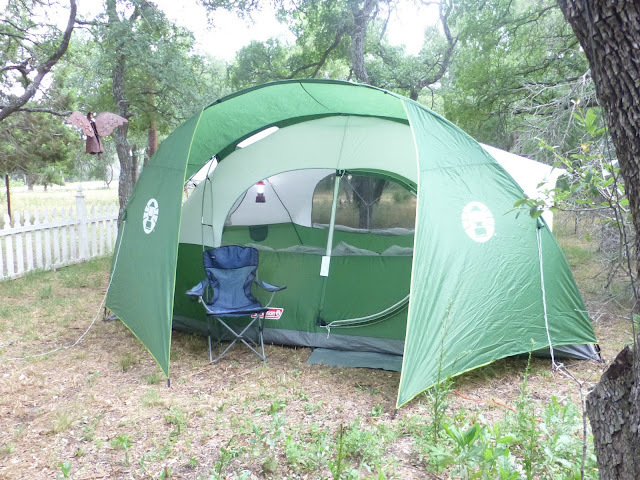 Just waiting, while living in Southern California for a good old earthquake to shake things up so we could camp out in the back yard in that tent. Who knows, it may be eaten to shreds in that box, never opened! ROTFLOL!!! Well Jim if it floods then you have your ark.... or maybe not. Better get to higher ground. You are just too enjoyable. Enjoy your weekend. I think the throw pillow a great addition - looks pretty during the day - useful at night! When you lay down after a hard days camping - you need something to rest your computer on - the pillow is just perfect! This post makes me happy! I loved camping as a kid and camping in your own back yard- the BEST! Especially since the wireless internet reaches! I have often wondered how I could make cards outside without chasing paper and you have just given me my answer! 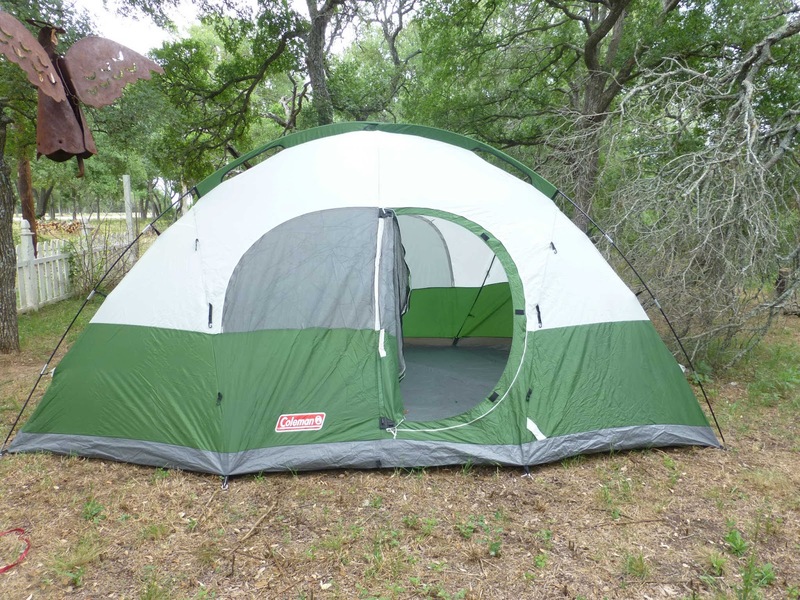 Want to help me pitch my tent!! Have a memorable weekend! hahaha you are too funny but I shouldnt laugh because we actually pitched a tent one summer outside the backdoor because it was too hot to sleep in the house. Now that looks delightful...and the only tools you should work with are ones for crafting! Have a fabulous weekend. Jim: You had me smiling so wide just now. I used to car camp all over with my late hubby. I loved the quiet, and the time to reflect and to just "be". I found the time camping was just such great quality time. I am now remarried to a non camper who is worried about me going off to camp for a weekend, so I am now jumping around thinking I am going to camp in my yard too on a nice weekend! You always inspire me, but this inspiration will be for my soul and for that I am ever grateful. I will let you know how it goes. I cracked up that you had WIFI! 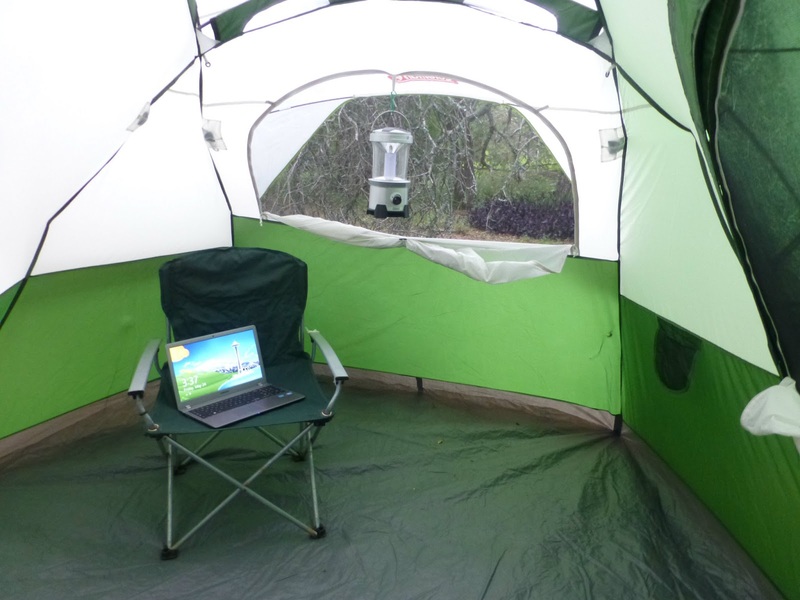 Very cool, blogging from a tent will be a first for me! LUV IT!!! we do the same thing but in our travel trailer...we spend the week-end in it..its fully equipped.. even the brewing of coffee is so outdoors..oh how fun!!! Camping in my backyard (and with my dogs) is definitely more my thing, but I'm not brave enough to do it this time of year. (Because of battling the heat and humidity. I don't handle that very well). How cool is that? Hope the rain didn't spoil your fun! Hope all those poor folks getting a deluge in San Antonio dry our soon! Nothing like a gentle rain while relaxing in a tent. Thunder and lightening not so much. LOL hope you enjoyed your day! Have a relaxing and peaceful holiday weekend! I wish I had done that! But I gave my camping gear to the neighbors when my husband died. So instead of camping in the back yard, I spent the rainy day at the vet for doggy checkup, Tuesday Morning, pet food store, Joanns, Michaels, Home Goods, Archivers, Hobby Lobby, and Kohls. Needless to say, the day I was supposed to spend in my craft room, I spent adding more stuff to the craft room. Ahhh, the pressures we put on ourselves. Fabulous! I love that you are creating your own adventure! I think it is the best idea ever! 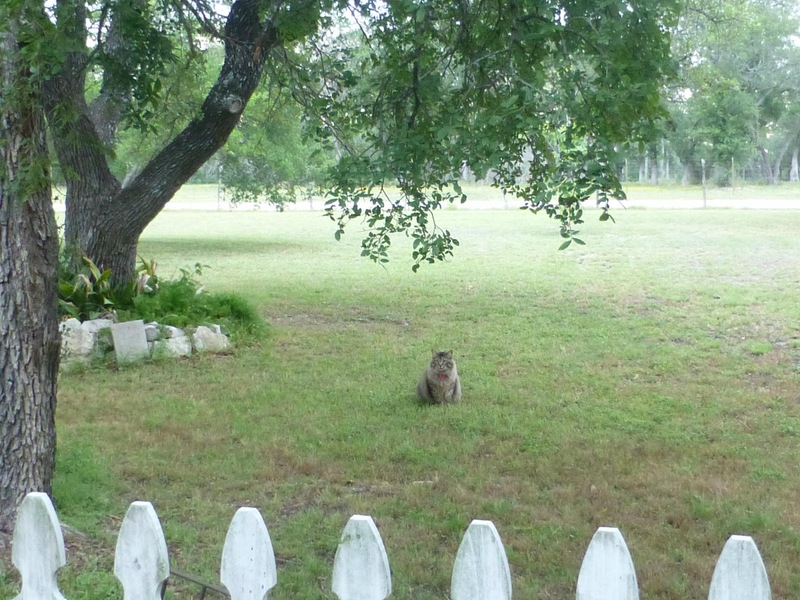 I will have to see if you "weathered the storm" or if you felt bad for Buzzy and took him back into the house! LOL! Love your pictures and Kudo's for working on the tent by yourself!!! I love it! I just got home from a camping trip in my parents back yard, but we camp in a 5th wheel now. I hope you had a great time, I love the sound of rain on the tent! Hi Jim, hope you don't mind me using your Christian name, I found your blog via another blog I was skipping through!. Well what can I say , I stopped skipping and ended up spending the last 11/2 hours reading through your very entertaining blog, you have a way of writing that made me feel as if I was actually there with you on your journeys!..so I have become a follower and will be back regular to visit! Ps my Daughter and her Husband are visiting California next week and will be driving from San Francisco to Los Angeles in a Red Mustang! Jim, I think your outhouse needs a Thinker sitting in it. Maybe with old newpaper collage on the inside. I can also see a small flower pot nesting on the stump in front of the door. 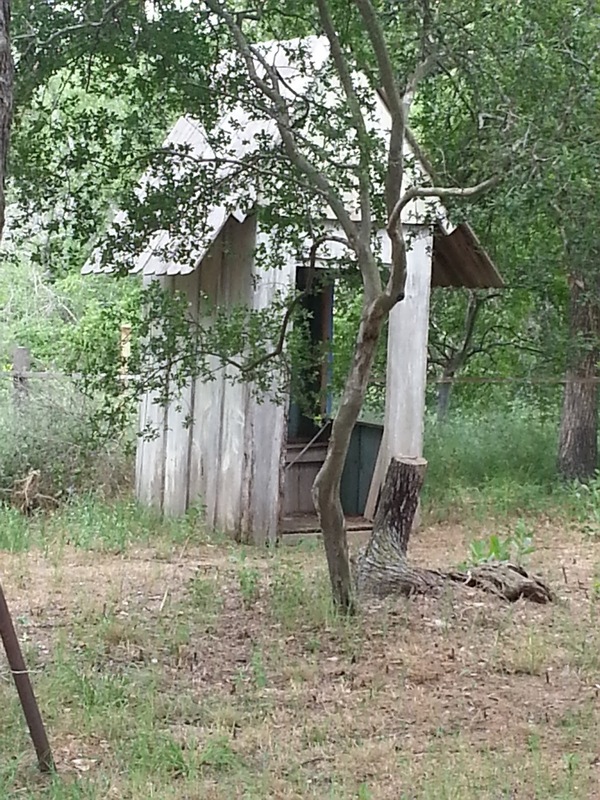 The outhouse is a perfect canvas, go for it.